Need a Dentist near El Casco? We are Worth the Drive! Has it been a struggle to find the perfect dentist in your community? 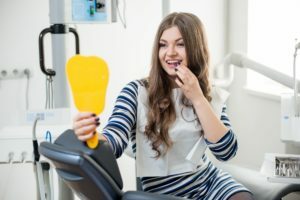 You have unique oral health needs, so not just any dental office will do. You need one who takes the time to get to know you to create personalized solutions to help you reach your oral health goals. To get the care you deserve, maybe it is time to look for a dentist near El Casco? Dr. Scott Parker raises the bar for high-quality dental care. He is worth the drive to get the exceptional services you expect. Our dental team believes in providing more than just cookie-cutter dental services. We want you to feel at ease with your decisions. We take the time to get to know your needs and your personal preferences. Dr. Parker builds a relationship with you to better understand your unique situation to craft a treatment plan that is specific to you. Working along Dr. Parker’s side is a professional dental team supported by vast experience in the field. We understand the realities of life and how they can impact your oral health. We make you feel like family from the moment you walk through our door to help you relax while we make it our mission to ensure your satisfaction. Your oral health needs constantly change throughout your life. We do not want to see you referred to another location to get the care you depend on. We provide the complete services you require in-office. Dr. Parker embraces the latest treatments, technologies, and methods to deliver the highest standard for care from one location. He creates precise and accurate treatments that add convenience and comfort to the services your teeth and gums rely on to stay healthy. Finances should never stand in your way of a healthy smile. We work with many leading insurance carriers to maximize the value of your policy to keep your treatments affordable. To cover any remaining out-of-pocket expense, we accept a variety of payment options, including CareCredit. We know your life is busy. We want to make it as easy as possible to maintain your dental appointments. Besides a convenient location, we also have the flexible office hours you need to see your dentist regularly. If you cannot find the right dentist in your community, we are worth the short drive. You will enjoy state-of-the-art dental care that caters your individual needs. We look forward to helping you reach and maintain optimal oral health. Dr. Scott Parker earned his Doctor of Dental Surgery degree from Loma Linda University. He remains well-versed in the latest innovations by continuing his training regularly. He believes dental care should have a personalized approach, which is why he takes the time to get to know each of his patients. Dr. Parker provides the exact services you need through all stages of life to ensure your smile lasts for a lifetime. Contact our office today to schedule an appointment. Comments Off on Need a Dentist near El Casco? We are Worth the Drive!